Lübeck Haus and our King's Corner Store offers hundreds of additional items for sale, including home furnishings, kitchen essentials, unique book ends, curio cabinets, desk & wall clocks, table lamps, eagle statues, travel luggage, tool sets, collectable porcelain dolls, statues & sculptures, model sailing ships ready to display, unique chess sets, hunting knifes and swords, fencing rapiers, birdhouses and feeders, garden fountains, garden decor, planters, home decor, and many other useful products for your home, office and garden. To read more about each item for, availability, current prices, shipping costs, or to order one or more of these items, click on their catalogue number. From pasta to soups, this versatile stock pot makes gourmet cooking a breeze! Multipurpose 8-quart set lets you steam, boil and cook up all your favorites. 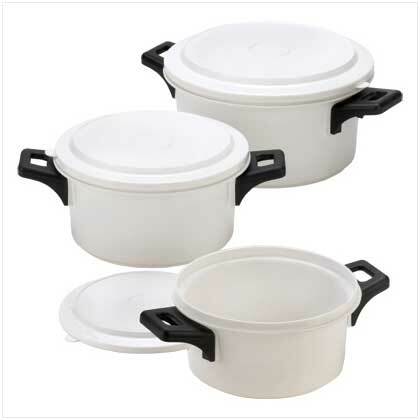 Three-piece set includes outer pot, strainer insert and lid. Stainless steel and glass lid. Suitable for dishwasher; hand wash recommended. Weight 4.2 lbs. Set: 13" x 10" x 10 1/4" high; strainer: 13" x 10" x 7" high. Stovetop kettle heats up quickly, allowing you to brew up your favorite beverage to savor and share. 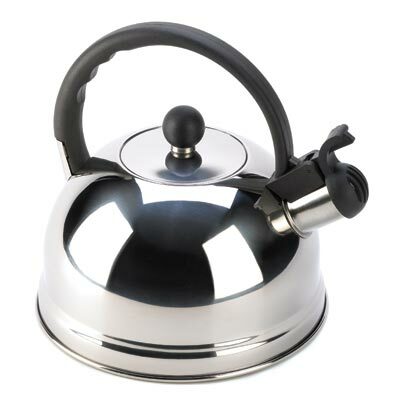 With its bright chrome finish and cheery whistle, it’s sure to become a part of your treasured tea-time tradition! Holds 2.5 liters. Stainless steel and plastic. Hand wash only. Item Weight: 1 lb. 8 1/2" x 8" x 8 3/4" high. 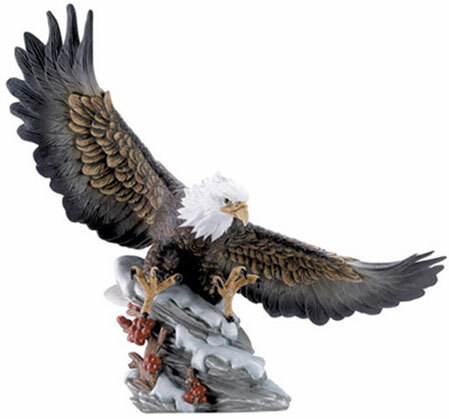 Returning from a successful flight this eagle touches terra firma once again. Intricately sculptured and made from porcelain. Measures: 10 ¼" x 5 ½" x 10 ¼" high. This three-piece set lets you cook multiple meal courses at once! It includes a three-section pan, a dual-section pan, and a vented simmer lid. Both pans feature durable nonstick surfaces for easy cooking and cleaning. Stainless steel. Hand wash only. Item weight: 2.5 lbs. 2-section pan: 10" x 15 5/8" x 2" high; 3-section pan: 11 7/8" x 17 3/8" x 1¾" high; lid: 12" x 12" x 2¾" high. Stainless steel. Hand wash only. Stimulate your skin back to health with this hand-woven gift basket filled with gels, lotions, bath salts and more body care products. Specially formulated with healing ginger. Measures: 9¾ " in diameter x 8½ " high. 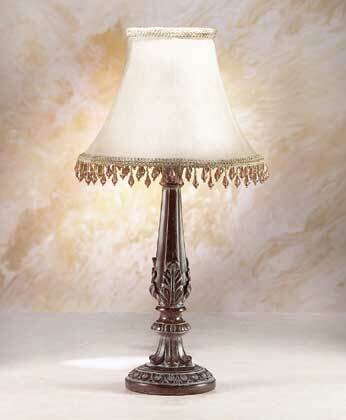 Bedazzling in a bedroom or den, this lamp has a shade embroidered with gleaming amber beads, lending any room Moroccan mystique. Alabastrite mahogany base. Includes a UL approved power cord. click on CATALOGUE #32276 . This sturdy set of travel luggage is just the right ticket for vacations, business trips, or weekend jaunts. Pick just the pieces that you need for each trip and leave the others home. 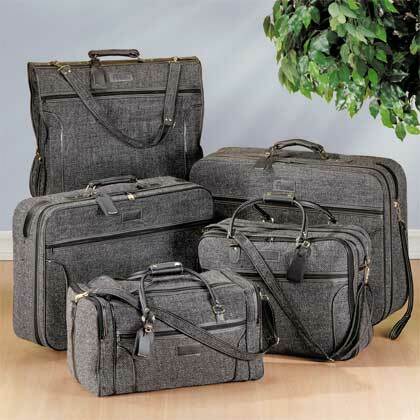 This truly stunning 5-piece travel set made from fine Indian Jute. Indian Jute is famous for its "flexible strength," which means that in addition to being stylish, it's also a great long-term investment. (28" x 20" x 8¾" and 26" x 18" x 8"), Duffel Bag (21½" x 12" x 11"), Carry-On (21" x 16" x 8"), and Garment Bag (44" x 23" x 3"). Dark gray "tweed" with vinyl trim. 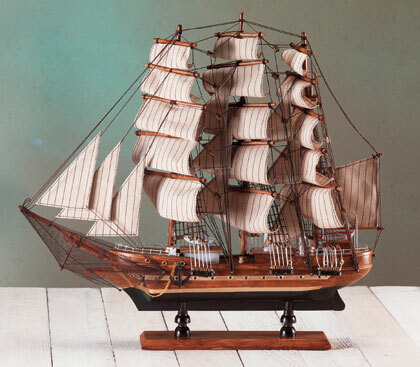 This detailed model of a schooner sailing ship is carefully built with wood with attention to detail. Would make a great addition to your den, office, or living room. Includes mounting upon it's own base. This is a sample of a few of the more than 3000 products that are for sale at our online and mail order store. To visit the King's Corner Store's website and catalogue directory, please Click Here . Select what you need, place your order, and Amazon.com will ship your order to your home, office, laboratory, cabin, airport ware house, or fishing boat dock. Kindle readers can be carried with you everywhere. Emagine what hunting, fishing, hiking trips, college studies, vacation planning info, and travel destination information can be stored within these modern marvels, and be carried with you in your pocket, or backpack. One kindle reader can holds up to 3,500 books, including maps, and including pictures of your choice. We offer this selection of kindle readers, and a growing selection of kindle audio books. To read about the Kindle Fire Family, and the Kindle Fire HDX 8.9, the Kindle Fire HDX, the Kindle Fire HD, and to select your own kindle reader, please click on the one of your choice. For individual kindle reader descriptions, price, and availability, click on your choice. Read the details, to purchase, place your choice in the shopping cart at the Amazon.com page and complete your purchase by following their instructions. Click on and browse through more than 350,000 kindle books and kindle editions of books. Click on the product category, book category, or magazine subscription of your choice, then select an item from that gategory to read about the details and to order. The Weekly Shopper Continues . Return to Shopping Directory . Catalogue directory for travel luggage, home furnishings, furniture, tables, cabinets, table lamps, linen goods, kitchen essentials, unique bookends, collectable plates & vases, small curio cabinets, model sailing ships, chess sets, hunting knifes, sabertooth tiger skulls, desk & wall clocks, bird houses & feeders, garden sculptures, home & garden decorations, and other fine products for your home, den, and garden. Offers an extensive selection of more than 500,000 unframed or framed fine art prints, wall tapestries, photographs, and wall posters in hundreds of categories. Choose your own custom frames from countless combinations of framing and matting materials. All right on your computer screen, and with great customer service and at afordable prices. Go to Lübeck Haus Photography Department . This department offers all name brand cameras, photography equipment & accessories, software, books, magazines, photographs, photo taking tips, and web links. Visit our main store for video and DVD movies, music CD's, kindle readers, kindle books, home & office electronics, computers, software, video games, cellular phones, contractor's equipment, power tools, hardware, clothing & apparel, jewelry, magazines, games and toys. Remember, ordering online through Lübeck Haus Store and Bookstore links is convenient, safe and easy, guaranteed. Thank you for shopping at Lübeck Haus, we do appreciate your business. We hope to see you again. This page was revised and updated July 06, 2015.